This is a really fun book. I think adults will love this book as much as kids do, at least I know I did. The story was interesting and each little paragraph had a yoga pose illustration so you could see how to do it. One example was “Children bike home from their village school. Hello, children”. Then there was a drawing of how to do the knees to chest pose like you do riding a bike. I loved learning the English/Indonesian word comparisons. One I learned was Good morning/Selamat pagi. You also learn how to pronounce the Indonesian words for counting from 1 – 20. The illustrations were big, bold and colorful. At the end of the book is a list of links for parents and teachers that would come in handy for those who wanted to learn more. The book is targeted toward children 2-5, but I think anyone wound enjoy reading and learning from this book. her daughter. She lives in Boston with her husband and daughter. never too early or too late to go out into the world on their own adventures. Thank you so much for your lovely review of Hello, Bali, Vicki. I am so glad that you enjoyed the yoga book and some basic Indonesian. It’s such a fun language to learn. I really appreciate you taking the time to join our book tour and offering your recommendation! You’re very welcome! I enjoyed it so much! Sounds like a fun book – one I’d probably get as much out of as the kids. You’re right Carol, you probably would. I know I did! I read and reviewed this book too. It was the 2nd one I had read from her and was a fun read. I too liked the translations. 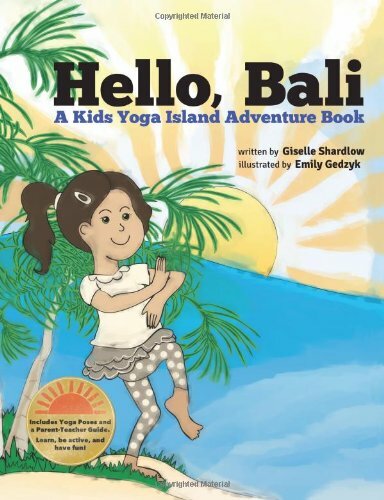 I was able to review Hello, Bali a couple of weeks ago. As a big fan of yoga myself, I loved this story for kids. The simple poses and picture associations are wonderful. Thanks for sharing!